Modern Roof Co., LLC provides professional commercial roofing with the equipment and experience to guarantee successful and timely completion. Commercial roofs often use low-slope roofs (also known as flat roofs) meaning they have a roof pitch under 2/12. 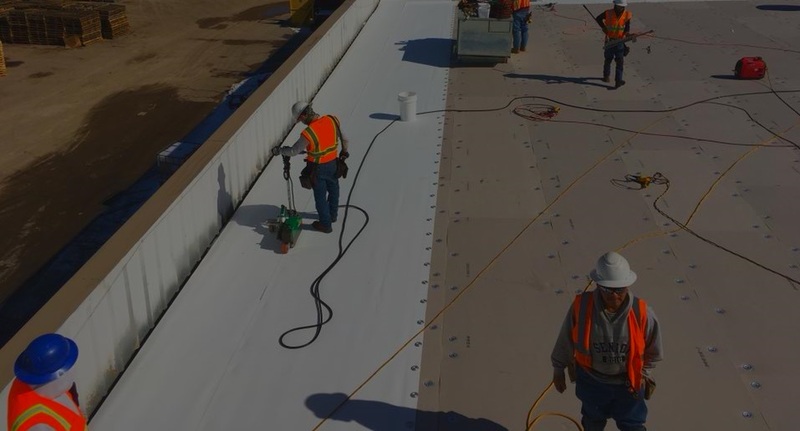 Flat roofs cover many different commercial buildings including industrial, office buildings, multi-family, hotels, sports complexes, retail, restaurants, and many more. Modern Roof Co services all sizes and types of low-slope roofs. We know that your roof protects your most valuable asset, and we want to make sure you’re covered. Our services include new roof construction, roof repair and maintenance, reroofing, insurance claims, and roof coatings. Modern Roof Co., LLC has the equipment and experience to guarantee successful and timely completion of your commercial roof. There are several roof systems to choose from. Many commercial roofs use roof membranes that come in either single-ply or multi-ply. Single-ply roofs include TPO, PVC, and EDPM. Multi-ply, or Built-Up and Modified Bitumen, roof systems use multiple layers to secure your roof. Metal roofing uses sheet metal to provide a durable and long-lasting solution. Roof coatings is a low-cost solution to make sure your roof stays waterproof and prevents costly roof leaks. With the new Denver Green Roof Ordinance in effect, we now also specialize in green roofing. We use low-slope approved and top-quality materials to ensure your roof is secure and long-lasting. Flat roof systems can adhere to the building in a variety of ways. Some commercial roofing systems are only able to use one system, while other roof systems can use several distinct types. The type of roof decking and existing roof system can predetermine the type of commercial roofing system. In the past, many Built-Up roof membranes used large diameter gravel on top of their roofs. The gravel weighted the roof down enough to prevent wind damage while offering some of the best fire resistance on the market. When’s the last time you saw a rock on fire? Roofing trends have allowed this system to capture around 80% of the market, mechanically attached systems are the most popular flat roof adhering system. With easy installation, easy inspection, and a lower cost, this roof system is an easy choice. Screws go into the roofing membrane, through the insulation boards, and directly into the metal decking. This is a great option for single-ply roofing systems like TPO, PVC, and EPDM. Roofers use glue to fully adhere roofing membranes. Fully adhered systems are among the highest for wind resistance. The installation requires more screws and the glue requires the correct temperature and weather conditions to fully adhere. Increasing in popularity, induction-welded roof systems use specially coated metal plates to form a chemical bond to the roof membrane. After installation, an electric current tool runs over the plates to induce heat, melting the underside of the membrane. When the temperature cools, the roofers use magnets to complete the chemical bond. We all know Denver has unpredictable weather. It is common to experience all four seasons in a single day. Not to mention the possibility of intense storms that can bring hurricane force winds and hail down on your roof. Modern Roof Co is well-versed in how to go about claiming your insurance when storms hit. Our claims experts guide you through the process to make sure you get the maximum amount from your insurance company and also providing a strong roof replacement to protect your building. We handle the details for your roof insurance claim and provide free inspections for every customer. Whether the storm has already hit or if you want to plan ahead, Modern Roof Co has all the resources you need. Modern Roof Co., LLC has made a name for itself because of reliable service and open and honest communication. We are with you every step of the way to make sure you get the highest quality customer care. The Modern Roof advantage is we create a connection every customer. We do this because we care deeply about the quality of our work and are not satisfied until you have a roof you can be proud of. We are more than your average commercial roofing company. Call today and talk to one of our commercial roofing experts to get your free estimate. Denver, Colorado is where we call home. We are proud to call ourselves locals and provide Denver and the surrounding areas with top quality commercial roofing services. Our professionals have been in the construction industry for over 35 years and when combined, we have close to 100 years of experience. We are locals and as a result, we care deeply about the community we build around us. Modern Roof Co puts care and consideration into every project. Every customer is a new connection. Even while our business grows rapidly, we treat every customer like it is our first. Without a strong community around us, our business would not be as prosperous as it is. We want to create this connection with you. Our business goes further than providing good service. Above all, our mission is to add you to our growing community of satisfied customers. Contact us today to get a free estimate.